Welcome to our Weddings page. 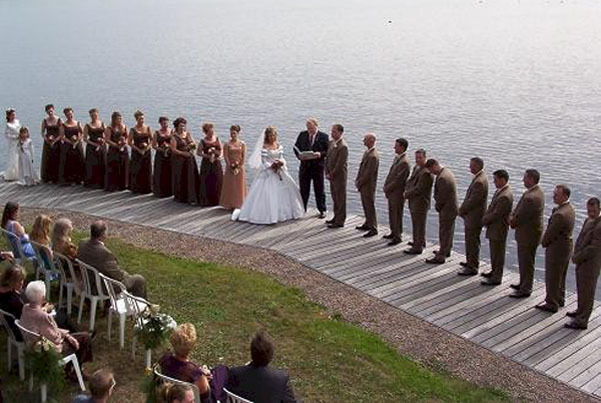 This page is about weddings only. For other information about our inn please refer to the rest of the website. 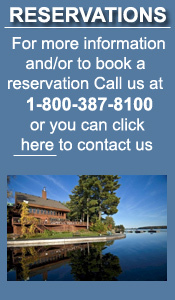 Our lakeside Boathouse Lounge seats 70 comfortably at tables for your sit down served meal. It is also where your reception and dance will be held. We have large bar, fireplace and dance floor.. A large lakefront deck is adjacent for those who want to get some fresh air or socialize. We can host approximately 80 – 90 for a stand up cocktail party style reception … A few tables and chairs will be provided. Larger numbers can be accommodated by renting a marquis to cover the large 80 x 20 lakefront deck along with tables and chairs available June thru September. Empty rooms will not rented to other guests not attending the wedding because we cannot guarantee the quiet atmosphere people expect. Bride is responsible for payment for rooms not rented. 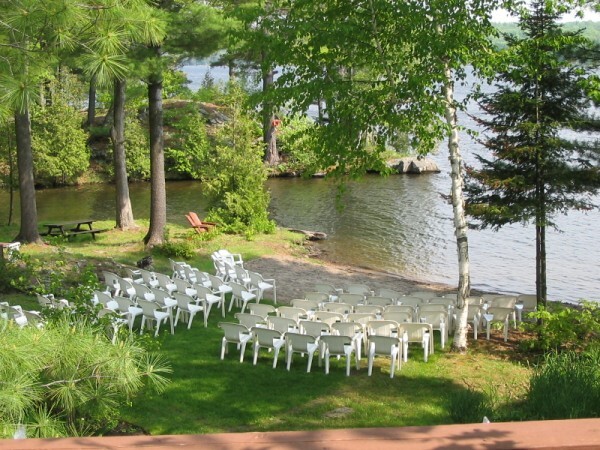 The above 35 room rental requirement does not apply to the elopement package or small last minute mid- week weddings. Limited only by your imagination. 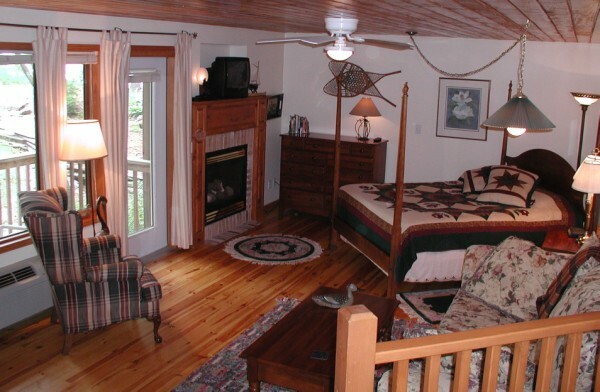 Choose the beach, boardwalk, lakefront deck, lobby, many gardens, arbour by the chalet or the meadow by the forest. 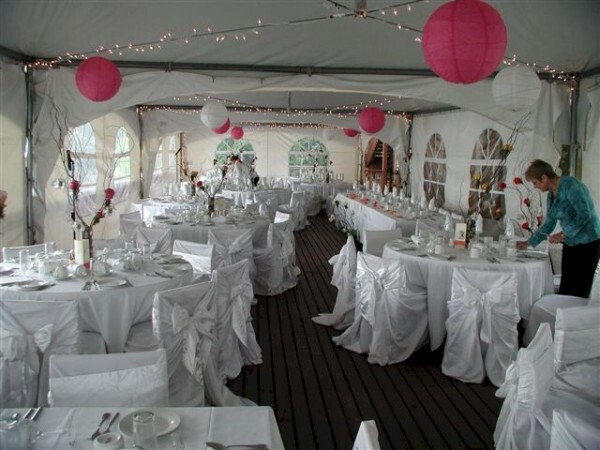 Brides may wish to rent chairs, chair covers, runners, an arbour. So many things to think about and we are here to help! Don’t forget about decorating the room…flowers? Guest seating (names). A bbq on arrival of day one is a much appreciated and a fun event for your friends and family. Bonfire… sing along…. Next morning a leisurely breakfast followed by whatever activities the guests wish, organized or on their own. Golf? Boating, fishing… depending on time of year. X-C skiing, skating on the lake. Finally the Wedding! 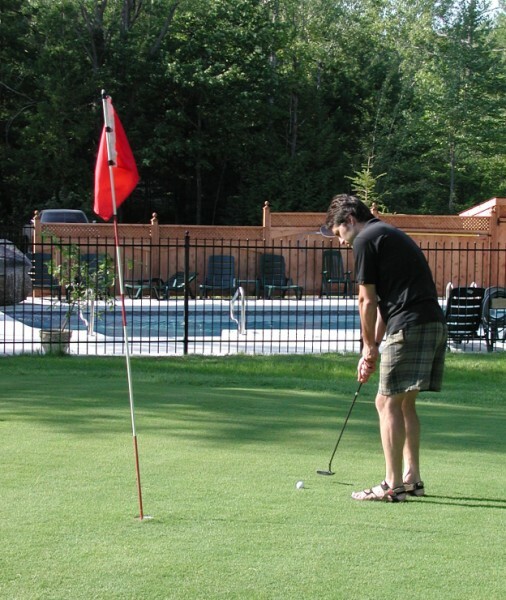 And no one needs to leave the property to drive home…. No drinking and driving allowed. Retire to your own cosy room. Morning after… breakfast…. Goodbyes… Some may wish to stay for another day or two. We will offer a special rate before and after. Please contact us if you require additional information. To see if we have availability for your event please provide date, expected number of guests, any special requirements and your budget. We look forward to meeting you and giving you a tour of our Inn!